Go to original pattern for design DROPS 69-24. Width: 29 cm. Height: 31 cm. Width: 22 cm. Height: 14 cm. 150 g. col. no. 02, light turquoise. 100 g. col. no. 10, dark turquoise. + small amount of 4 different colors. Colors used in photographed purse: col. no. 31 lilac, col. no. 05 light lilac, col. no. 41 mustard and col. no. 39 pistachio. DROPS Wood beads: 20 beads. DROPS 3 mm and 4 mm needles, or sizes needed to obtain correct gauge. 21 sts x 44 rows = 10 x 10 cm on smaller needles in garter st.
19 sts x 25 rows = 10 x 10 cm on larger needles in stockinette st.
Row 1 (wrong side row): knit with 2 strands as follows: K 1 (edge st knit in garter st throughout), * P 2, pass 1st st over 2nd *, repeat from * - * until 1 st remains, K 1 (edge st knit in garter st). Row 2 (right side row): Change to single strand of yarn and knit as follows: K 1 (edge st), K 2 sts in each st from previous row until 1 st remains, K 1 (edge st). 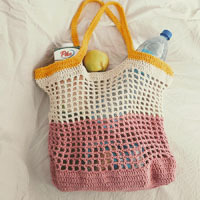 Large Purse: The purse is knit in 2 pieces and sewn together at bottom and along sides. 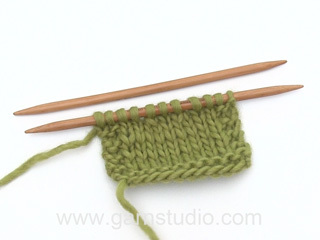 Cast on 62 sts on larger needles with light turquoise. Knit 4 rows garter st, then change to stockinette st. When the piece measures 22 cm change to 1 strand mustard and 1 strand pistachio and knit Pattern - see instructions above - then 2 rows stockinette st with light turquoise. Change to 1 strand light lilac + 1 strand lilac and knit Pattern then 2 rows stockinette st with light turquoise. Change to dark turquoise and smaller needles. Knit garter st for 4 cm, bind off. Knit a second identical piece. Assembly: Sew side seams using edge sts as a seam allowance and sew bottom seam. 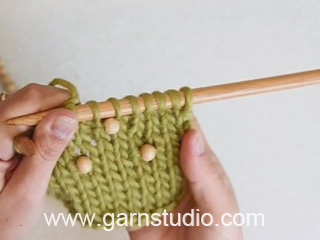 Shoulder strap: Pick up 14 sts at one side on smaller needles with dark turquoise. Knit garter st, and dec 1 st at each side every 4 rows until 8 sts remain. 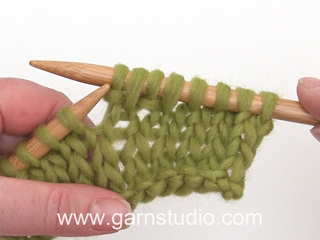 Continue on these 8 sts until strap measures approx. 50 cm, bind off. Repeat on the other side of purse. Sew 2 strap ends together. Beads: Sew 12 small strands with beads around purse. 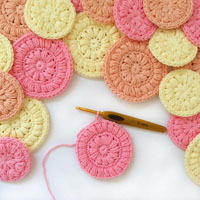 For each strand, cut a piece of yarn approx. 15 cm long in light turquoise. 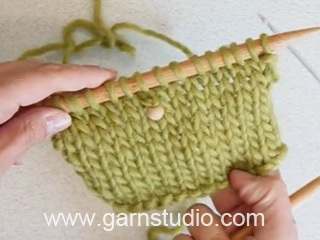 Thread 4 beads onto yarn, fold yarn double around the bottom bead and thread yarn through the other beads again. Fasten the doubled yarn 4 rows under first Pattern row, and 10 sts apart. 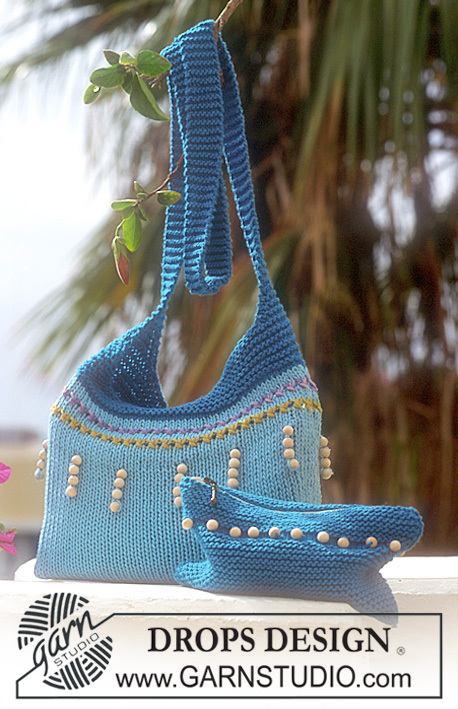 Small Purse: The purse is knit in 2 pieces and sew together at bottom and sides. Thread 10 beads on dark turquoise yarn, then cast on 47 sts on smaller needles. Knit 4 cm garter st, then 5 rows stockinette st (seen from the right side) - on the 3rd row of stockinette st knit in beads as follows: K 5, * K 1 with bead, K 3 *, repeat from * - * until 6 sts remain, K 1 with bead and then K 5. Be sure beads come out on right side. 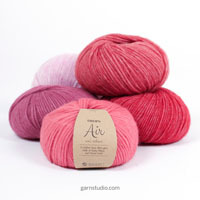 Knit the rest with garter st. Bind off when the piece measures 14 cm. Make a second identical piece. Assembly: Sew side seam using edge sts as seam allowance and sew bottom seam. Sew in zipper.